Above: Located at the intersection of the Loop 101 and 202 freeways on a 47-acre site at the southeast corner of Price and Willis roads, the 617,000-square-foot campus for Orbital ATK will serve as its Launch Vehicles Division Headquarters along Chandler’s Price Road Corridor within Park Place. The Virginia-based aerospace and defense company Orbital ATK started construction on two buildings along Chandler’s Price Corridor that will serve as the firm’s Launch Vehicle Division headquarters. The two buildings will total 617,000 square feet on a 47-acre campus. There will be 261,000 square feet dedicated to manufacturing on the site. Last year, Orbital ATK hired 250 employees in Chandler and the company is working to fill 200 open positions and expand its Chandler footprint by another 50 employees in the next year and a half. Orbital ATK announced that it will expand its launch vehicles division in Nov. 2016, and these new Arizona jobs are part of that expansion. The company has a growing footprint in the southeast Valley and it’s been growing since the 1980s. Orbital ATK has operations for all three of its business groups in Arizona. Orbital ATK’s launch systems group is in Chandler with 1,500 employees and plans to hire 200 more, said Trina Patterson, director of communications for the Launch Vehicles Division at Orbital ATK. Those employees will be located at this upcoming facility upon its completion, Patterson said. Orbital ATK has elements of its defense group located in Mesa and its space systems group also has facilities in Gilbert that work on projects like the Iridium NEXT satellite network. The Chandler facility will work on rockets that will help protect the nation and deliver payloads to the International Space Station, Patterson said. In the launch systems group, “everybody will be under one roof and it will help bring our consistencies and synergies together and be more cost-effect for (Orbital ATK) in the future,” Patterson said. Ultimately, there will be 2,000 employees working at Orbital ATK. These jobs are high-wage engineering and manufacturing positions. Orbital ATK’s payroll in Arizona totals around $170 million in salaries, Patterson said. The facility is being developed on the southeast corner of Price and Willis roads in Chandler. The Douglas Allred Company is developing this project with Willmeng Construction serving as the general contractor. Balmer Architectural Group is the architect of the upcoming facility and CBRE is the brokerage firm. Construction is scheduled for completion in 2019 and the facilities will be the latest addition by Douglas Allred Company’s Park Place, a 180-acre masterplanned office/flex space development. The masterplan is located near the Loop 101 and Loop 202 interchange. When Douglas Allred Company first purchased the land where Orbital ATK is building its latest facility, there was a dairy farm located there. Now, the Douglas Allred Company has been developing office projects along the area that has quickly become a technology hub. Chandler – After four years in the making, the Marriott-Chandler hotel and conference center is finally set for development within the Allred Park Place business park located along the Price Road Corridor in Chandler. The 264-room, full-service hotel is being developed by a joint venture formed by Winegardner & Hammons Hotel Group LLC (WHG) in Cincinnati, Ohio (Mike Conway, chairman). Construction on the eight-story building is expected to start in the next few weeks, with completion anticipated by the first quarter of 2019. Western & Southern Financial Group in Cincinnati (John Barrett, chairman) is a partner in the deal with WHG. The venture has now completed the acquisition of the 7.17-acre hotel site, which is at the southwest corner of Price and Willis roads. Price Road Hotel LLC (WHG/Western & Southern entity) paid $5 million ($16 per foot) to purchase the property. The seller was CAZ 5 LLC, formed by Douglas Allred Co. in San Diego, Calif. (Douglas Allred, David Allred, principals). The cash transaction was brokered through Mark Krison, Luke Krison, Michael Strittmatter and Brad Anderson of CBRE in Pheonix. Plans for Marriott-Chandler include 20,000 sq. ft. of meeting and conference space, a 24-hour M Club lounge, restaurant, bar, outdoor pool and patios, business center and fitness center. Development cost (land and building) estimated at $60 + million. Maricopa County records show the WHG venture is developing the project with a $30 million loan from Fifth Third Bank. The hotel and conference center, which includes a 10,000-square-foot ballroom, is bringing a much-needed amenity to the Price Road Corridor. While the area has several limited service hotels, industry professionals say none of the existing hospitality properties have meeting space to accommodate larger-sized groups. Upwards of 1,000 guests will be able to be seated in the Marriott-Chandler ballroom, which will be the centerpiece to the planned hotel. “The one type of property the Price Road Corridor doesn’t have is a full-service hotel with significant conference space,” says Valley hospitality sales executive Bill Murney of HREC Investment Advisors in Pheonix. Murney, who has been selling hotels in the Pheonix market for more than three decades, says WHG’s success likely will depend on there being enough demand in the area to provide Marriott with groups that are willing to pay a higher rate to stay in a hotel where they can also hold their meetings. “I think they will do well given that positioning opportunity, and I believe there will be adequate demand to drive the rate they need to generate the projected bottom line they are trying to achieve.” Although the hotel will have the Marriott brand and the rooms will be booked through its reservations system, it will be managed by the privately-owned WHG. Winegardner & Hammons Hotel Group is an affiliate of Pyramid hotel Group (PHG) in Boston, Mass. The Marriott-Chandler will be the first hospitality property in the Pheonix market for WHG, which manages 20 hotels across the U.S. Pyramid Hotel Group, a third-party manager of 71 hotels, manages The Wigwam resort in Litchfield Park, Hilton Garden Inn Phoenix Airport North in Phoenix, and the Graduate Tempe hotel in Tempe. To date, Douglas Allred Co. has developed and leased 615,901 sq. ft. of office and flex space in seven buildings at Allred Park Place. The mixed-use project, located south of the Loop 202 (Santan Freeway) where it intersects with Loop 101 (Price Freeway), is planned for office, retail and hotel uses. The CBRE agents have the marketing assignment and are looking for tenants to lease roughly 350,000 sq. ft. of Class A office space planned in two more structures that should be under construction by year-end. Find out more from Conway at (513) 794-2462. Talk to the Allreds at (858) 793-0202. Reach the CBRE agents at (602) 735-5555. Call Murney at (602) 732-4777. This schematic shows a bending Price Road splitting several buildings between Willis Road and Armstrong Place. 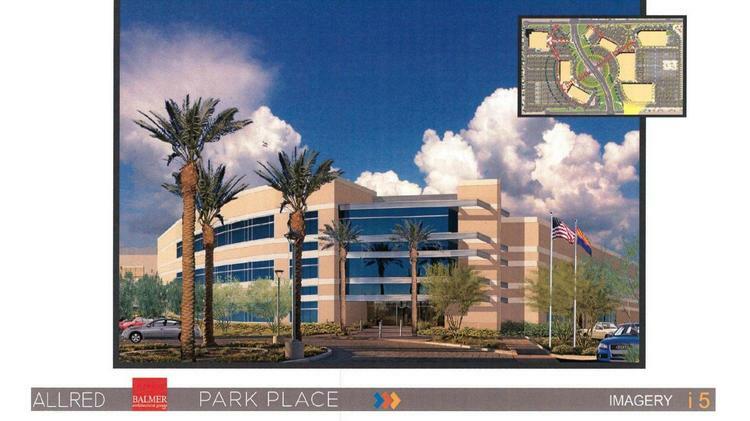 Developer Douglas Allred said he can’t wait to get started on Park Place II, a massive expansion of Park Place I that will bring 928,000 square feet of new office space and a hotel/conference center to a 62-acre campus near Price and Willis roads in Chandler. The Chandler City Council greenlighted Allred’s rezoning request July 28. The property had been zoned for agriculture. A proposed hotel/conference center and a pair of mid-rise office buildings anchor the portion of the campus on the west side of Price Road. An additional four office buildings and a parking structure are planned on the east side of Price road. Allred’s Park Place I, southeast of the San Tan Freeway and Price Road, has six fully leased office buildings with 2,400 employees and hosts such notable companies as Infusionsoft and Healthways. Once completed, Park Place II’s total annual economic impact is estimated at $1.4 billion, according to a report from Scottsdale-based Elliott D. Pollack & Company. The City of Chandler will derive most of the benefit, but the East Valley as a whole will also share in the increased economic activity. The study said Park Place II will generate $19.4 million in annual tax revenue for the state, $6.4 million for Maricopa County and $2.5 million for Chandler. The Chandler Unified School District stands to gain $1.5 million in annual tax revenue from Park Place II. The new project will create more than 2,000 construction jobs and employ an estimated 9,691 when built. The Chandler City Council has approved development plans from San Diego-based Douglas Allred Co. for a 928,000-square-foot office park. Allred’s Park Place II will be located on both sides of Price Road at Willis Road and Loop 202. The office park is going on land that was previously a dairy farm and was previously zoned for farming. Allred has already built Park Place I in Chandler. That is home to Infusionsoft and Healthways. A report by Scottsdale-based Elliott D. Pollack & Co. pegs Park Place II’s long-term and one-time economic benefits at $1.4 billion. Allred’s development plans also call for a hotel and conference center. Construction will create more than 2,000 jobs and Park Place II is expected to house another 9,700 workers. San Diego-based Douglas Allred Co. is partnering with two other firms to buy two Tempe office buildings for $29.3 million. Allred, Phoenix’s DW Capital Partners and New York’s Angelo, Gordon & Co. have bought 1330 W. Southern Ave. and 3001 S. Priest Drive in Tempe. The office and back-office centers total 250,000 square feet. El Segundo, California-based Cordia Capital Management was the seller. It was represented by Mike Beall, Chris Walker, Sean Spellman,Jeff Wentworth and Will Strong of Cushman & Wakefield. Allred is based in San Diego but has had some significant real estate investments in Arizona. Private equity firm Angelo, Gordon has also invested in some Phoenix area real estate. The new owners plan on renovating the Southern building. Phoenix – The Douglas Allred Co. in San Diego (Douglas Allred, David Allred, principals) has acquired two properties within the Phoenix International Sky Harbor Airport area to develop almost 200,000 sq. ft. of office and flex space. The Douglas Allred Co. has been one of the most active developers, buyers and sellers of industrial and office buildings in the Valley. The privately-held company plans to develop a 107,817-square-foot flex, office project at 4141 E. Broadway Road in Phoenix. A company formed by Allred paid $5.168 million to buy that 10.53-acre site. Maricopa County records show Dared 90 LLC (Allred entity) acquired the property in a cash transaction. The sellers were Arizona Cotton Growers Association and Supima, both non-profit companies based in Phoenix. The buyer was represented by Mark Krison and Luke Krison of CBRE in Phoenix. The sellers were represented by Steve Mardian and Brian Lee of Cushman & Wakefield in Phoenix. The CBRE agents have the marketing assignment on the newly-planned development, which is being called Allred Broadway Center. David Allred says the flex building will be able to allow for back-office, high-tech assembly or other types of businesses. Balmer Architectural Group in Phoenix is designing the project. Construction scheduled to start in May, with completion following about 10 months later. Willmeng Construction Inc. in Phoenix to serve as contractor. Development cost (land and building) estimated at $15 million. Union Bank is providing the construction financing. Mark Krison says the company is hoping to find a single tenant to occupy the structure, but the flex property can also accommodate multiple tenants. The building, with 26-foot clear height, can be doubled in size with the addition of a mezzanine level. The project is parked at 7 spaces per 1,000 sq. ft. David Allred says the company plans to complete construction, lease-up and hold the asset for investment. The site, located south of Interstate 10, is about one mile south of another property recently acquired by Allred that is planned for an office project of almost 90,000 sq. ft. That 6.95-acre site is located north of I-10 at 4039 E. Raymond Street. Dared 89 LLC (Allred entity) paid $3.6 million to buy that parcel, which has been occupied by a 64,856-square-foot industrial building. The seller was Avalon Pacific-Santa Ana L.P. in Newport Beach, Calif. (John Heffernan, pres.). The buyer was represented by Jim Wilson of Cushman & Wakefield in Phoenix. Kurt Saulnier and Ken McQueen of Lee & Associates Arizona Inc. in Phoenix represented the seller. The manufacturing structure on Raymond Street, which was built in 1970, was razed to make way for the newlyplanned office. That two-story building is being designed by Balmer Architectural Group. Willmeng Construction is the contractor. David Allred says construction is set to start in March, with opening to follow 10 months later. The 89,889-square-foot building is being called Allred Forty. Development cost (land and building) estimated at $20 million. Union Bank is providing construction financing. Wilson has the leasing assignment and is looking for tenants needing from 20,000 sq. ft. and up. The project will be parked at 6.7 cars per 1,000 sq. ft. Look for Allred to complete construction, lease-up and hold for investment. Over the years, BREW has reported The Douglas Allred Co. developing millions of sq. ft. of office and industrial buildings in the Valley. In Chandler, the company is developing the 3 million-square-foot Allred Park Place business park within the Price Road Corridor. That mixed-use development is at the intersection of the 101 Loop and 202 Loop. The Douglas Allred Co. is looking for additional real estate investment and development opportunities in the Phoenix area. Find out more from the Allreds at (858) 793-0202. Talk to the Krisons at (602) 735-5555. Reach the C&W agents at (602) 253-7900. Call the Lee & Associates agents at (602) 956-7777. As the developer of the most square footage in the Price Road Corridor over the past decade, we read this paper’s recent article about the area with great interest. Essentially, the article by Chris Coppola talked about the changing marketplace for technology companies that are no longer seeking to obtain their own land use entitlements and build massive, single-user buildings. Think Intel. This is a critical discussion. The new market of employers are seeking to locate quickly in buildings already built and ready to move into. Allred has built six office buildings on spec (before tenants were identified) and are now working to complete our seventh. That’s some $215 million invested in the Price Road Corridor of Chandler. Every day we are talking to potential users about what they want and how quickly they want to move in. Here’s the reality. Of the 39 companies actively looking for space in the Valley right now, only two are looking for space of 150,000 square-feet or more. Two. This means 37 of the most desirable jobs opportunities couldn’t locate in Chandler, south of Willis Road, even if they wanted to, because without the Innovation Zone, the current city requirement is for buildings to be at least 150,000 square-feet in size and have only a single-user. The economic development officials in Chandler are very good, but no one is so good that they can be handicapped with such restrictions and best compete against the aggressive efforts of Phoenix, Tempe and Scottsdale. Consider one of our Chandler tenants, Infusionsoft. Theirs is a great Arizona success story. They originally started with 46,000 square-feet and have since grown to 160,000. And they continue to grow. Under current rules, Infusionsoft wouldn’t have been able to do this south of Willis Road, along Price. Does that make sense? These are the very companies we want. Fortunately, there is both a short-term solution a long one as well. 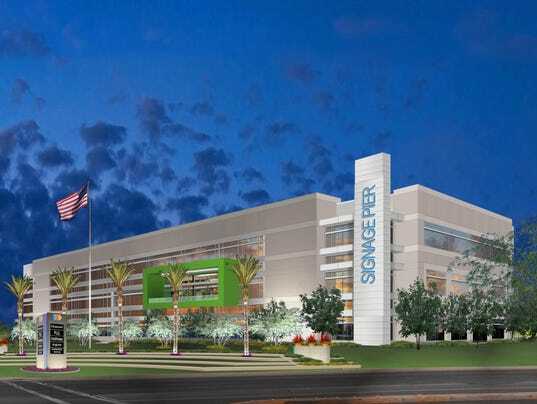 To help Chandler’s continuing economic development efforts, we are preparing to invest hundreds of millions more in the area, with additional spec office buildings within a beautiful campus environment, so that fast-moving, nimble companies can have a desirable place to move into quickly. In order to increase our 650,000 square-feet to 2 million we are seeking to use a General Plan-approved tool in our PAD called an “Innovation Zone” to build these spec buildings for the technology companies of today, and tomorrow. This innovative planning tool was used to allow multiple-users into the old Motorola building and can serve the city well again as it responds to a changing market and increased competition. As happened with the Motorola redevelopment, this will immediately spark substantial new investment and more jobs. Right now, we have 2,400 employees in our buildings. We hope to triple that after our next project is approved. No company has been or is more bullish on the Price Road Corridor than we are. That’s why we are constantly monitoring trends, changes, competition and other dynamics that could impact the area. For example, when the marketplace started telling us it was time to bring a hotel conference center to the area — the city’s first — we listened and will soon start building it. Now, the marketplace is telling us something else. And city economic development officials, as described in the recent article, are making changes to keep up with the times. We applaud them for this. By staying pro-active we can all keep the Price Road Corridor the best one for jobs in Arizona. If building 650,000 square feet that is one hundred percent leased in Chandler’s Price Road Corridor wasn’t enough, the Douglas Allred Company now wants to increase that amount nearly fourfold. 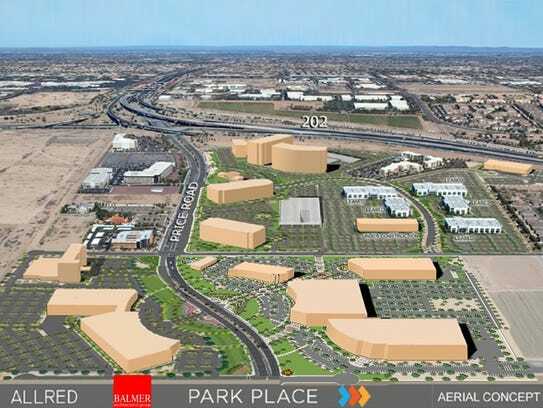 To be known as Park Place II, Allred will soon be filing its application with the City of Chandler for up to two million square feet of its business campus, flanking both side of Price Road with high value employers. The project will expand upon what the corridor’s most prolific developer has already built in and around Price and Willis Roads. That current portfolio includes six office buildings with 2,400 employees that are fully leased, representing an investment of some $215 million to date with a seventh building now under construction. Nearly 650,000 square feet is completed of what will ultimately bring Allred’s total development space in Chandler to nearly three million square feet. Tenants in Park Place include some of the Valley’s most notable technology companies including Infusionsoft which has grown from 40,000 square feet to nearly 260,000. Several months ago, Allred received unanimous Chandler City Council approval to build the city’s first conference center hotel in this area. In the past nine years they are the only developer of spec buildings on the South Price Road Corridor. 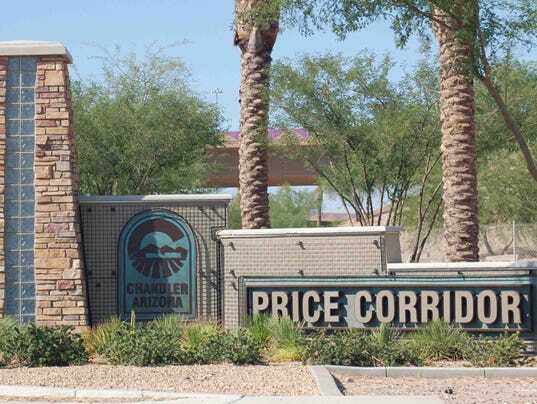 “We build throughout the western United States but we’re as bullish on Chandler and its Price Road Corridor as anywhere we do business,” company CEO David Allred said. “Thanks to the wisdom of the Chandler City Council and Chandler voters who passed a forward looking idea called “Innovation Zones” in its 2008 General Plan, we intend to build a campus-like environment to help the area stay a premier jobs center as it competes more directly with Tempe, Scottsdale and Phoenix for the jobs of the future,” Allred sad. He said only two of the 39 employers pursuing office space in the local market today are seeking space over 150,000 square feet which means he and Chandler will need to be more nimble in the future to attract the companies of the future. Additionally, Allred said companies don’t want to wait months or years to entitle and build offices. They want to move immediately which requires developers to build spec space that are ready to use immediately. Adapting to the changing marketplace has served Allred well as they have been the primary company to have built new buildings in the Price Road Corridor for the past decade. The company hopes to have all approvals from Chandler by year’s end so it can commence construction on its next phase in the second quarter of 2016. The San Diego-based developer will submit plans for the next phase of Park Place — a sprawling complex along Price Road between Loop 202 and Germann Road — to city officials this week. Allred will ask for special zoning on part of the property to give greater flexibility in attracting new tenants. Park Place will eventually cover 185 acres in south Chandler with a mix of office buildings, hotels and a small amount of retail space. Six buildings are already complete and fully leased to companies like Infusionsoft and Healthways. A seventh building is scheduled to open next month. Infusionsoft, a software company that started in Gilbert, moved its headquarters to Chandler’s Park Place in 2012, starting with about 40,000 square feet of space and expanding to 260,000 square feet, developer David Allred said. Developing the business park on speculation, without prior commitments from tenants, has helped Allred lure fast-growing companies like Infusionsoft that need space quickly. Allred plans to begin construction next on a three-story, 120,000-square-foot office building in the center of the complex on Price Road. Then, the developer will set its sights on a major expansion to the south, where it could develop nearly 1 million square feet of office, hotel and conference center space. The Chandler City Council last year approved plans for a Marriott-brand hotel and conference center near Price and Willis roads in Park Place, and construction could begin later this year or in early 2016. The hotel will have 264 rooms, and the conference center will hold up to 1,000 guests. Allred’s property is unique because just one owner holds the land straddling Price Road, presenting an opportunity to create a two-sided campus feeling for drivers entering the corridor from Loop 101 and Loop 202 to the north. Allred is in fact seeking a formal “innovation zone” status from the city in its application this week. That designation would allow it to be more creative in bringing smaller new businesses to the Price Road Corridor, which Chandler initially envisioned as a campus-type environment for large-scale employers like Motorola and Intel.City zoning rules for the area require new development to be at least 15 acres — enough space for a 150,000-square-foot office building — and have a single tenant. The innovation zone allows developers to circumvent those rules, as long as the development is campus-oriented with a mix of knowledge-based industries such as biomedical, aerospace and renewable energy. Innovation zone rules have given new life to the former Motorola campus just south of Park Place, which the company vacated in 2008. The property has since been rebranded as the Continuum business park, now home to companies like Nationstar Mortgage and OnTrac Shipping. Allred hopes to do something similar at Park Place, where a workforce of roughly 3,000 employees could grow to between 10,000 and 15,000 workers. Allred’s zoning request will ultimately go before the City Council for consideration, and land-use attorney Stephen Earl said that process could take as long as six months. If plans are approved, construction could begin shortly thereafter. On the northern end of Park Place, the company is holding several acres in reserve for future development, including buildings up to 10 stories tall. Construction is expected to begin in October on a Drury hotel near Price Road and Loop 202, and construction is wrapping up now on retail buildings in the same area. In addition to Park Place, Chandler’s Price Road Corridor is home to major employers like Intel, Wells Fargo, PayPal and Orbital ATK. Nearly one-third of the 32,000 jobs in the area are in high-tech manufacturing and development, and about 17 percent of employees work in engineering, research and design, according to Maricopa Association of Governments data.